Buying ugly produce is about more than simply fighting food waste. It’s also about supporting family farmers. We believe that part of creating a better food system means providing financial stability to farmers, which is why we’re committed to making farming as economically and environmentally sustainable as possible. 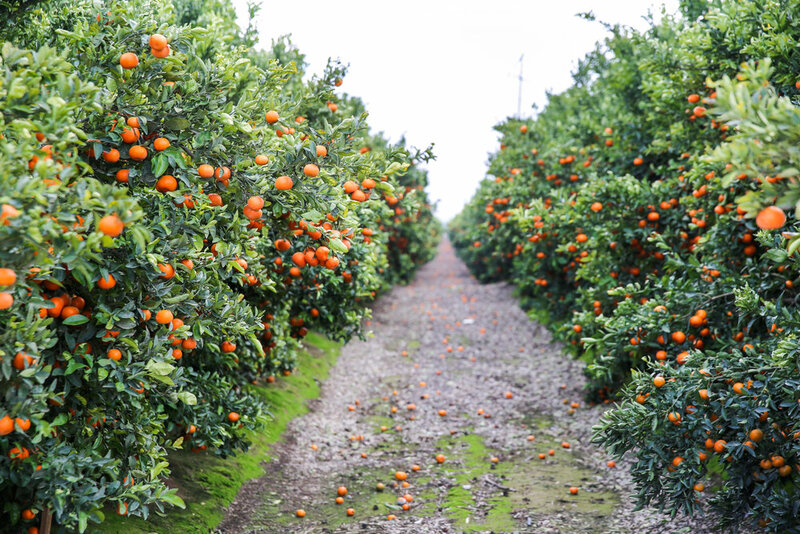 We recently took a road trip from our HQ in San Francisco to the heart of citrus country and learned exactly why financial stability matters so much for family farmers. For the Kaprielian family in Reedley, California, generations of farming have taught them a lesson (or two) in the importance of adapting with the unpredictable. While Bianca Kaprielian and her sister, Angelica, grew up running in their grandparents citrus groves, their father, Craig, didn’t want his daughters to enter into such an emotionally and physically exhausting line of work. Taking their dad’s advice, Bianca became a documentary filmmaker while Angelica became a mechanical engineer. Years later, their roots in Reedley, CA drew them back to help their parents work on the family citrus farm. Spending time with the Kaplan's in the fields left us with many lessons, but the biggest one of all was what a miracle getting citrus from the tree to the table really is. Having learned what it’s like to be a family farmer, and seen just how unforgiving agriculture can be, all of us at Imperfect are doubly committed to making it easier for families like the Kaprielans to have a sustainable livelihood. Bianca’s friend and partner, CJ, explained that farming is like a particularly thorny science and engineering problem, with many variables to try to understand and control. However, unlike other types of science, you only get one chance each year to get it right. One of the most difficult things about farming is that many of the biggest variables are also the ones that you have the least control over. For example, if it rains during the Mandarin harvest, they’ll have to wait for the fruit to dry before they can pick it. This is because citrus rinds absorb water like a sponge, so wet fruit will either mold and fall apart during transit if they pick it too early or rot if they leave it on the tree. Timing is everything, but time seems to always be against them. Temperatures matter as much as rainfall. If the nights don’t get cold enough while the mandarins are ripening, they’ll stay green instead of becoming the beautiful orange color that stores want. Bianca told us that this has been happening more often lately because of global warming. On the other side of things, if it gets too cold, the frost will damage the fruit. During Christmas one year, Bianca and Angelica remember their dad staying up for 72 hours straight trying to keep their fruit from freezing on the trees. He ended up setting up huge fans around his precious trees to create a blanket of moving air to keep the fruit warm. The struggles don’t end even when farmers are able to successfully get the Mandarins out of the trees. After harvest, they face a marketplace that doesn’t want to buy a significant percentage of their crop just because it looks different. Even though Bianca and CJ know from experience that often the ugliest fruits are the tastiest, they quickly realized that retail buyers only want Mandarins that fit strict beauty standards: orange color, medium size, and no scarring. CJ learned this firsthand as a child. His family grew stone fruit, only to realize that most growers were breeding for high yield and uniform appearance, not taste. In the 1980s and 1990s, growers became obsessed with breeding for a uniform red color in peaches because this is what the retail buyers wanted. This made CJ’s dad get out of the business and advise his son to do the same. So what happens to their ugly mandarins at Fruit World? CJ and Bianca explained that in any given year, anywhere from 5-20% of their crop is unmarketable to stores because of how it looks. After getting picked, this fruit gets sorted out in the packing shed and will usually end up going to animal feed or sometimes a juicer. So while it wouldn’t technically go to waste, they emphasized that they actually lose money on it because they are paid pennies on the dollar any time they have to sell to the processing market. “When we have to sell to a juicer, we don’t cover the cost of the box that the fruit is shipped in, much less the labor that we needed to pick it,” said CJ. Bianca explained that selling to Imperfect is a dream come true because we can adapt to the needs of the trees instead of imposing our needs on them. Instead of rigid demands that create waste, we can work with nature, creating a more flexible and sustainable relationship for all sides. We think the story of Bianca and her family is so important because it reminds us that food waste isn’t just hurting the environment and missing a chance to feed people, it’s also making it harder than ever to be a family farmer. We can all do our part to build a more compassionate food system for folks like the Kaprielans. Now that you know more about the family behind some of the sweet citrus in your Imperfect box, we hope that your next bite will be filled with the sweet taste of gratitude. Jan 31 Smokebread Comes to the Bay Area!